Spring semester has completely flown by me, kind of like the wind here in Bowling Green. One second I was coming back from winter break and the next second I was back at home for spring break. Before you know it, my professors began giving out final projects and papers in preparation for the dreaded finals week. Finals week. The two words that send shivers down the spine of every student across the country. Just seeing these words make my eyes well up with tears. I’m almost certain my head began to pound and my heart rate increased. OK, OK. So maybe I’m being a little overdramatic. 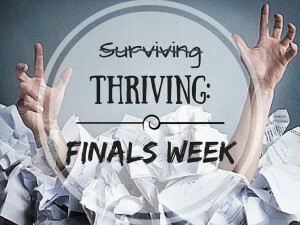 But in all honesty, finals week is hard and most times we all struggle to survive. We spend our final weeks on campus going through the motions. We either worry every second we are awake or we dream of the possible failure in our future (I guess that makes it a nightmare). I’m tired of this just-get-through-it attitude. It’s time for us to learn to excel and finish the academic school year strong. Start early. I know you don’t want to and I know it pains you to think about, but honestly it’ll pay off in the long run. 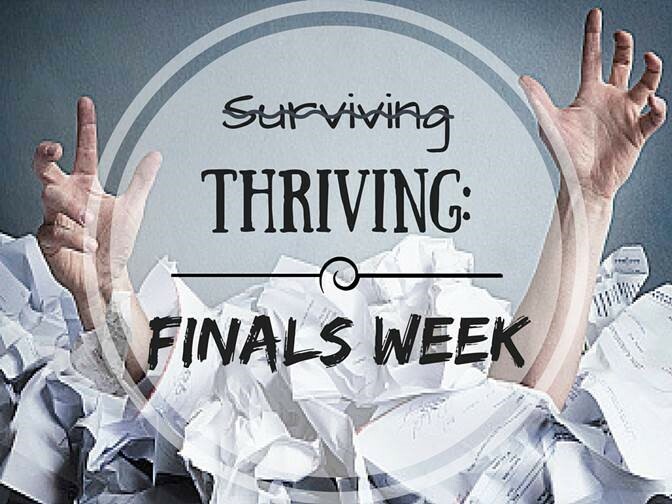 Begin studying weeks before finals get arrive in order to avoid the last-minute stress and cramming. The more you consistently go over the material, the better it’ll stick in your head and starting early allows you to do so. Make lists. Instead of stressing out about all that you have to do, write it all down. Sometimes when it’s all on paper, it doesn’t seem as overwhelming as you once thought. Plus, the feeling you get when you cross completed tasks off is definitely an added bonus. Find a good study spot. I recommend somewhere other than your dorm room. For me, I need to be on-location when I study. I spend too much time in my dorm room eating, watching Netflix, and socializing with friends that if I try to study there, my brain automatically falls back into that mode. If the library is full, (which it shouldn’t be if you’re starting early) try the lounge in your favorite academic building. Oftentimes these are great study spots that get overlooked. Check out this video of the Top 10 Places to Study at BGSU. Turn off your phone. Seriously, turn it off and put it away. You’ll be less inclined to check it if you cannot see it and it won’t distract you if it is off. You’ll be ten times more productive without it because you will be focused on your task at hand: acing those exams. Make goals for yourself. Decide what you should know, when you should know it, and keep yourself accountable. This will keep you on track. If you need a little incentive, give yourself a reward when you meet your goals for the day. Review, review, review. Since I know you’re going to take my advice and start studying early, you want to be sure that you don’t forget the material that you began studying early on when it comes time to take the exam. Make sure you remember to review the material you’ve already covered so it sticks in your brain. Give yourself something to look forward to. Sometimes all you need is to see the light at the end of the tunnel. Make a plan to treat yourself at the end of finals week and it’ll remind you not to give up. It’ll also motivate you to keep a positive attitude when you’re about to burn out. You’ve got this. You can do this. You’re almost there.